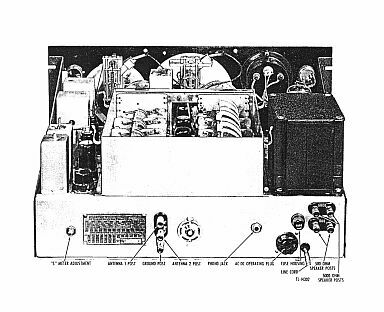 Radio Receiver AN/GRR-2 (Hallicrafters Model SX-28-A) is a 15-tube superheterodyne receiver covering the frequency range of 550 kilocycles (kc/s) to 42 megacycles (mc/s) in six bands. It is designed to receive amplitude-modulated (a-m) or keyed continuous-wave (c-w) signals. The receiver may be operated with the internal power supply from an a-c source, or from an external d-c source. The complete receiver weighs 78 pounds and is 16½ inches deep, 20 3/4 inches wide, and 10 3/4 inches high. Packed for shipment the set weighs 135 pounds and is 21½ inches deep, 27 inches wide, and 15½ inches high. All six bands are calibrated on the main tuning dial for direct reading, providing the band spread dial is set at 100 on the 0 to 100 scale. The band spread knob may be used for vernier tuning on any part of the four highest frequency bands, but the scale is only calibrated for a portion of these four bands. VALVES ( TUBES ) AND CIRCUITS. 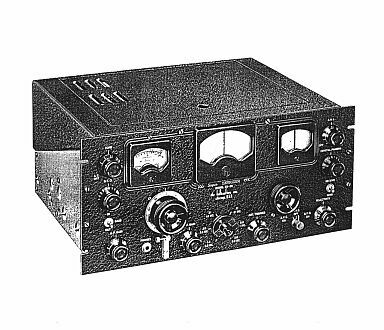 This receiver may be operated from either an a-c or d-c source. For a-c operation the line voltage must be within the limits of 110 to 125 volts at 50 to 60 cycles. A-c power consumption is 138 watts for a 117-volt, 60-cycle supply. For d-c operation, a 6-volt, 4.8-ampere heater supply, and a 270-volt, 150-milliampere high voltage supply are needed. DC power consumption is 108 watts. The power output of the push-pull audio amplifier is approximately 8 watts into a 5,000-ohm load. The sensitivity of the receiver varies between the limits of 6 to 20 microvolts for a 500-milliwatt output over the entire range of the receiver. The selectivity of the receiver is determined by the band pass of the i-f circuits. The SELECTIVITY control, in conjunction with the crystal-filter circuit, provides six degrees of selectivity. The width of the band pass is variable from a few hundred cycles at SHARP CRYSTAL position, to approximately 25 kc on BROAD I.F., at .50 percent down on the selectivity curves. The over-all audio-frequency response with the BASS switch at the IN position, the SELECTIVITY switch at BROAD I.F., and the TONE control at 9, is flat to within 2½ decibels (db) over the frequency range of 70 to 3,000 cycles. The i-f circuits are aligned to 455 kc, and the crystal filter has a natural frequency of 455 kc, plus or minus 5 kc. Radio Receiver AN/GRR-2, operating control panel. Manual containing 75 pages including the Circuits with Component lists and layouts. ( Please Click the Payment Links Below ).